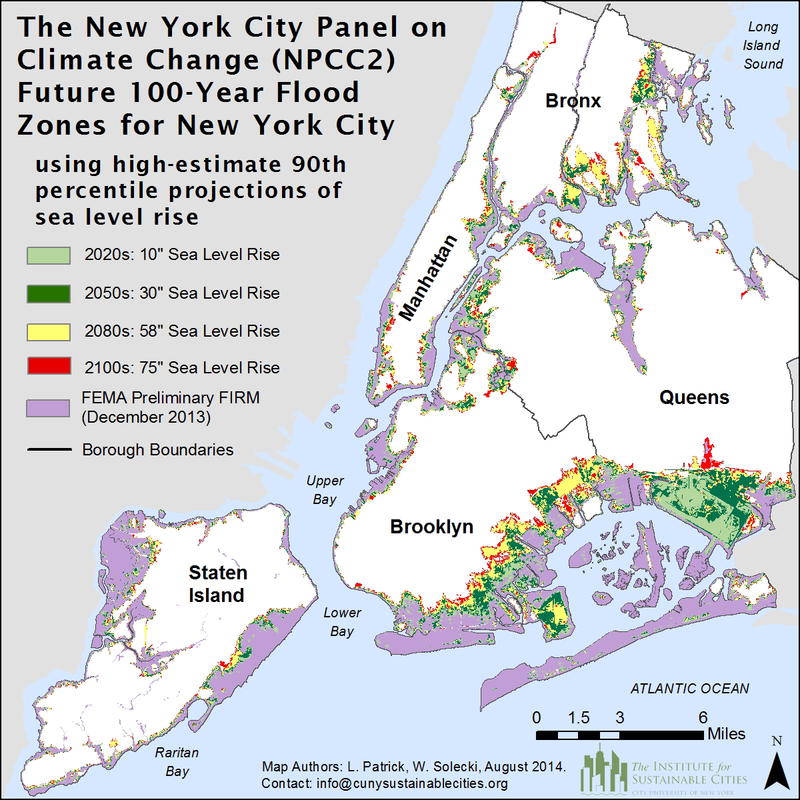 Future 100-year flood zones for New York City based on the high-estimate 90th percentile NPCC2 sea level rise scenario. The New York City Panel on Climate Change (NPCC) 2015, co-chaired by a NASA researcher, published its latest report which details significant future increases in temperature, precipitation and sea level in the New York metropolitan area. The report aims to increase current and future resiliency of the communities, citywide systems and infrastructure in the New York metropolitan region to a range of climate risks. Cynthia Rosenzweig of NASA’s Goddard Institute for Space Studies (GISS), New York, co-chairs the New York City panel. The NPCC was founded in 2008 to study the effects of climate change on New York City’s five boroughs and surrounding region. As some of the leading Earth scientists in the metropolitan New York area, GISS researchers have been involved in the panel’s work since its beginning. The GISS climate model was used in climate projections, and scientists at GISS led the technical team, which analyzed the scientific data and developed the projections. Increasing temperature and heavier precipitation events, along with sea level rise, are projected by the report to accelerate in the coming decades, increasing risks for the people, economy and infrastructure of New York City. 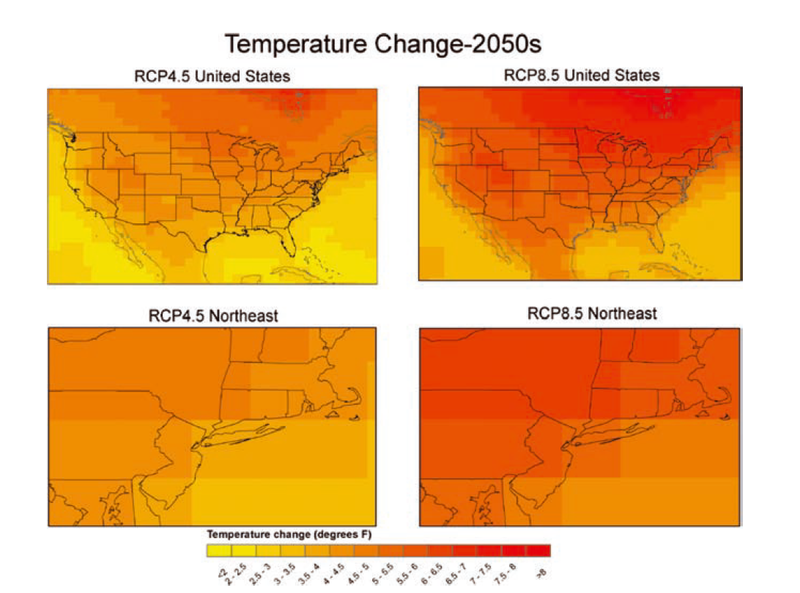 Map of annual temperature changes in the Northeast in 2050. – Mean annual temperature has increased a total of 3.4 degrees Fahrenheit (F) from 1900 to 2013. Future mean annual temperatures are projected to increase 4.1 to 5.7 degrees F by the 2050s and 5.3 to 8.8 degrees F by the 2080s, relative to the 1980s base period. The frequency of heat waves is projected to increase from 2 per year in the 1980s to roughly 6 per year by the 2080s. – Mean annual precipitation has increased by a total of 8 inches from 1900 to 2013. Future mean annual precipitation is projected to increase 4 to 11 percent by the 2050s and 5 to 13 percent by the 2080s, relative to the 1980s base period. – Sea levels have risen in New York City 1.1 feet since 1900. That is almost twice the observed global rate of 0.5 to 0.7 inches per decade over a similar time period. Projections for sea level rise in New York City increase from 11 inches to 21 inches by the 2050s, 18 inches to 39 inches by the 2080s, and, 22 inches to 50 inches, with the worst case of up to six feet, by 2100. Sea level rise projections are relative to the 2000 to 2004 base period. 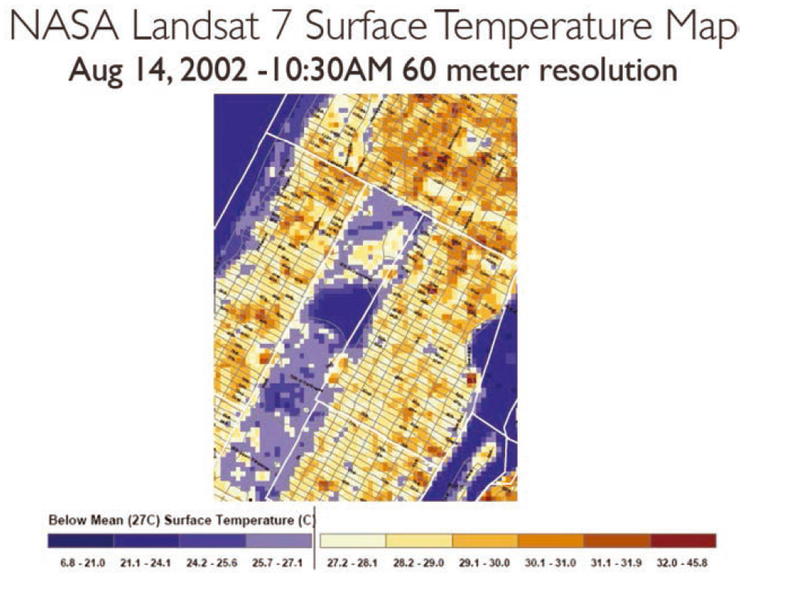 NASA LANDSAT surface temperature map of mid-town Manhattan with Central Park in the center. The report also uses NASA Landsat 7 data to map the surface temperature of mid-town Manhattan and show the cooling effect of Central Park. The Climate Impacts Group at GISS, led by Rosenzweig, provided technical support for the report. NASA has a Climate Adaptation Science Investigator (CASI) program that is geared toward evaluating the risks facing NASA facilities due to climate change. The GISS Climate Impacts Group is using processes and lessons learned during its work with the NPCC to support the CASI program. And CASI research focusing on the advance of key NASA products related to climate adaptation could also have future applications benefiting New York City. In addition, the proposed “Climate Change Resilience Indicators and Monitoring System” will utilize NASA data observations and measurements to help the city manage climate risk. GISS is a laboratory in the Earth Sciences Division of NASA’s Goddard Space Flight Center, Greenbelt, Maryland and is affiliated with the Earth Institute and School of Engineering and Applied Science at Columbia University.